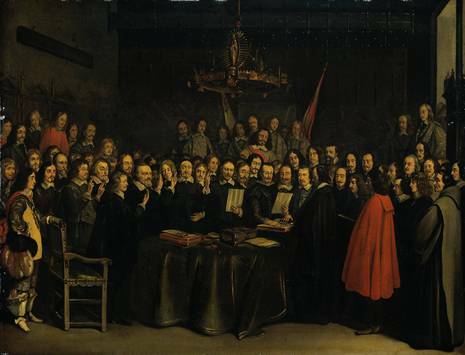 The term Peace of Westphalia refers to the two peace treaties of Osnabrück and Münster, signed on May 15 and October 24, 1648, respectively, and written in French, that ended both the Thirty Years' War in the Holy Roman Empire (today mostly Germany) and the Eighty Years' War between Spain and the Republic of the Seven United Netherlands. The treaties involved the Holy Roman Emperor, Ferdinand III (Habsburg), the Kingdoms of Spain, France and Sweden, the Dutch Republic and their respective allies among the princes and the Republican Imperial States of the Holy Roman Empire. 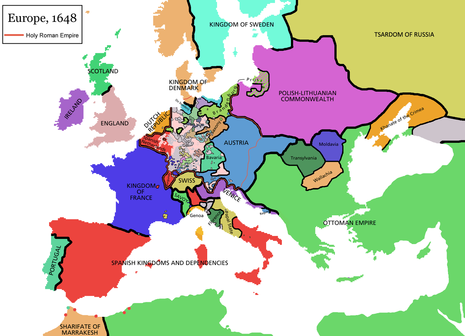 The Peace of Westphalia resulted from the first modern diplomatic congress and initiated a new order in central Europe based on the concept of state sovereignty. Until 1806, the regulations became part of the constitutional laws of the Holy Roman Empire. The Treaty of the Pyrenees, signed in 1659, ended the war between France and Spain and is often considered part of the overall accord. Peace negotiations between France and the Habsburgs, provided by the Holy Roman Emperor and the Spanish King, were to be started in Cologne in 1636. These negotiations were blocked by France. Cardinal Richelieu of France desired the inclusion of all its allies, whether sovereign or a state within the Holy Roman Empire. In Hamburg and Lübeck, Sweden and the Holy Roman Empire negotiated the Treaty of Hamburg. This was done with the intervention of Richelieu. The Holy Roman Empire and Sweden declared the preparations of Cologne and the Treaty of Hamburg to be preliminaries of an overall peace agreement. This larger agreement was to be negotiated in Westphalia, in the neighbouring cities of Münster and Osnabrück. Both cities were to be maintained as neutral and demilitarized zones for the negotiations. Münster was, since its re-Catholization in 1535, a strictly mono-denominational community. It housed the Chapter of the Prince-Bishopric of Münster. Only Roman Catholic worship was permitted. No places of worship were provided for Calvinists and Lutherans. Osnabrück was a bidenominational Lutheran and Catholic city, with two Lutheran and two Catholic churches for its mostly Lutheran burghers and exclusively Lutheran city council and the Catholic Chapter of the Prince-Bishopric of Osnabrück with pertaining other clergy and also other Catholic inhabitants. In the years of 1628-1633 Osnabrück had been subjected by troops of the Catholic League and the Catholic Prince-Bishop Franz Wilhelm, Count of Wartenberg, imposed the Counter-Reformation onto the city with many Lutheran burgher families being exiled. While under following Swedish occupation Osnabrücks's Catholics were not expelled, but the city severely suffered from Swedish war contributions. Therefore Osnabrück hoped for a great relief becoming neutralised and demilitarised. Both cities strove for more autonomy, aspiring to become Free Imperial Cities, so they welcomed the neutrality imposed by the peace negotiations, and the prohibition of all political influence by the warring parties including their overlords, the prince-bishops. The Peace of Westphalia represented a compromise rather than an unconditional surrender. Each of the combatants had experienced abrupt reversals of fortune during the course of the war: thus neither was willing to proceed on the assumption that the Emperor’s dire military straits would continue. Further, the interests of the Swedes and the French were sufficiently divergent that the Emperor was able to play one off against the other. For example, the Swedish desire for a guarantee of Protestant rights in the Habsburg domains was scotched by the French at Imperial insistence. The peace thus concluded thus had something for everyone and everything for no one.